The tool bar already offers a number of options, but given the frequent requests for even better adapted weeders than those already catered for, the design of a type of tobacco hoe available on this implement seemed indispensable to us. 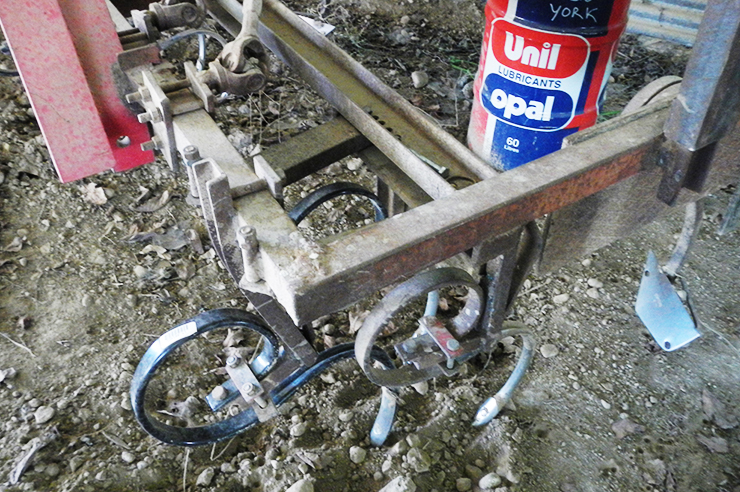 In fact, for tobacco and a number of other root crops, many farmers had already improvised such a tool on the platform of a vibrashank cultivator or a cultivator, using old Citroen 2CV drive shafts, seats from old mowers and scrap metal of all descriptions. These accessories allow a closer pass of the crops, when the weeds have become too large for the star-shaped finger weeders. The two operators can ‘slalom’ between the crops (cabbages, potatoes, etc. ), to remove the unwanted plants which had escaped the action of the ‘duck’s feet’ weeders between the lines. The speed needs of course to be adapted to the nature of the soil, the degree of weed infestation and the distance between the plants. 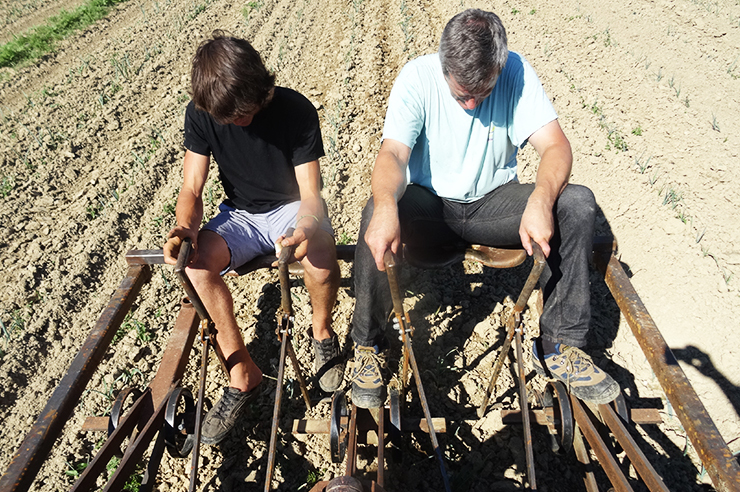 In some situations, it may be more comfortable to use one’s feet to steer the weeders, especially in harder ground. Using one’s feet can also help shift the soil where a small ridge is required over a young crop. In this way, the grass in a row of beans can be covered, for example. 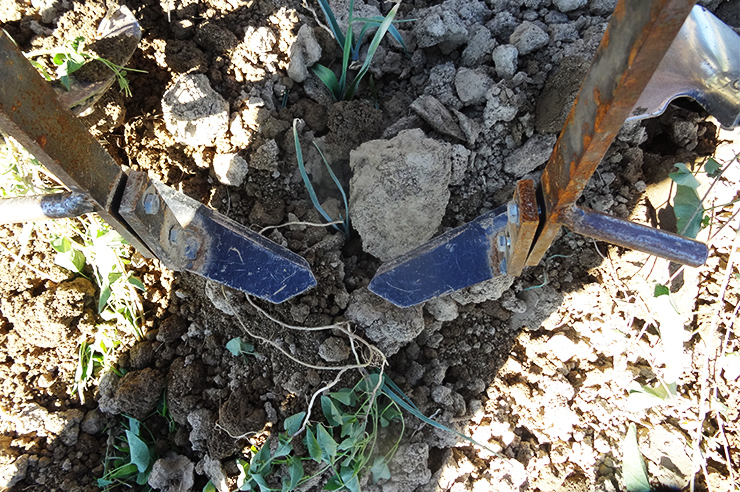 The tines at the end of the tool can be moved at will depending on whether one wishes to bring the soil right up to the base of the crops or not. 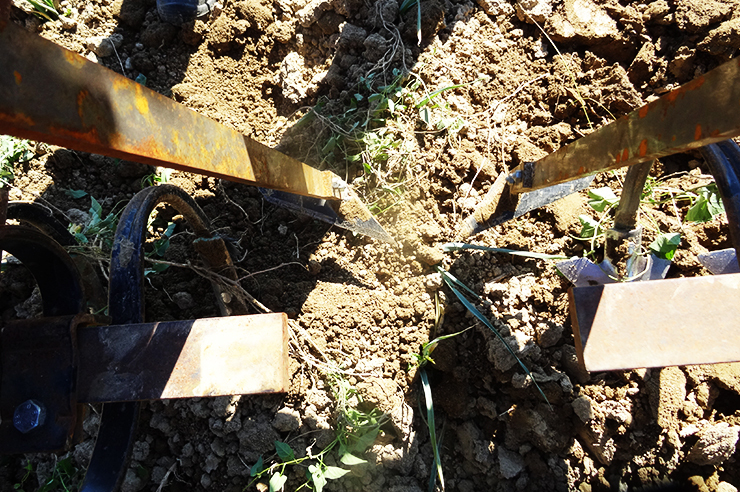 The photos and videos show these combined elements with very large (perhaps excessively so) tine bars which can (and do) obstruct the operation of the weeder bars. Furthermore, these arms are not mounted on a parallelogram, meaning that they reach too deep for weed control, especially in the middle of a section which is naturally higher. Ideally this option should be used with tine bars individually controlled by a gauging wheel, as befits all self-respecting weeders.  Plans will soon be available on the website showing how to combine different options and make the most appropriate adjustments according to the condition of the crops.